Triplets Haley (left), Suzanne and Beau Harriman of Fort Worth, Texas, share a light moment in front of the University of Mississippi’s Triplett Alumni Center. Captivated by the hospitality shown to them at Ole Miss, triplets from Texas all decided to attend the university and started this past fall. Haley, Suzanne and Beau Harriman, triplets from Fort Worth, were so taken with Mississippi that they even named their dog, Archie, after football legend Archie Manning. The oldest of the three, Haley, said when they were visiting other schools, they asked one another if they could picture themselves living there. “Then, when we stepped on the Grove and on campus, we all said, ‘This is it,'” she said. Though the three siblings are tight, they are quick to point out their different interests: Haley is an accounting major, Beau is a business major, and Suzanne is a hospitality management major. 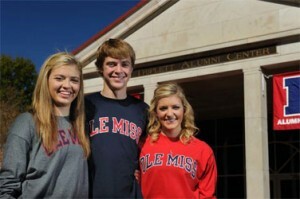 The triplets said even when people back home ask them why they chose Ole Miss, it’s impossible to just pick one thing. Despite their different majors, the triplets have many classes together this semester. “We all have math and history together, and Suzanne and I have music together, and Haley and I have racquetball with each other,” Beau said. He said his schedule keeps him busy and productive. Suzanne said she wanted to be able to grow as an individual and not just as one of the three, all while keeping her siblings nearby. They agreed that at Ole Miss, they are able to have their own identities, without being forced to be together. For the Harrimans, being a set of three just seems normal, they said. Usually, parents don’t empty the nest all at once and will have had a few years to adjust to their children being gone. But the Harrimans agree being out-of-state is a good thing. “I think, ultimately, our parents are sad we’re gone, but they know we are happy, they know we are keeping up our grades, and they know we aren’t getting in trouble,” Haley said. “They know we are in the right place,” Suzanne said. “And they know we’re together,” Beau said. “And they know we are safe,” Haley said.